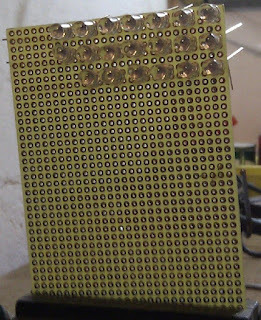 After a very frail Pringles Led Matrix that kept falling apart, I turned myself to a perforated board. 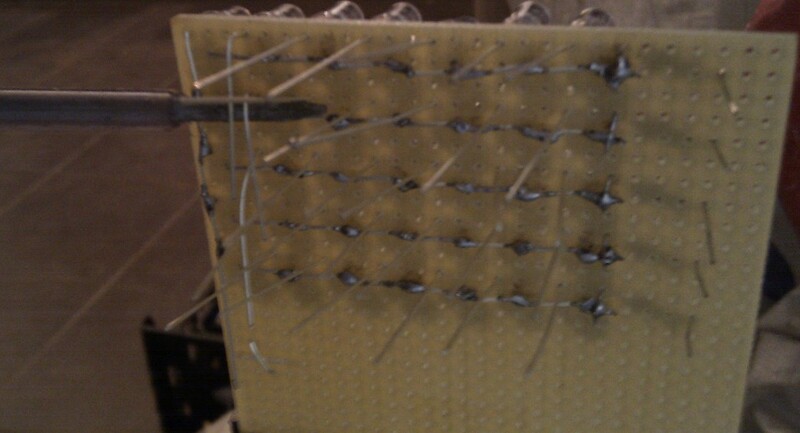 I chose to use 7 anode rows and 5 cathode columns, for no particular reason. To test the connections I used a 9V battery and a 220 Ohm resistor. That creates a current of 27mA during the test. My Leds support 30mA max, so it's fine for testing purposes. 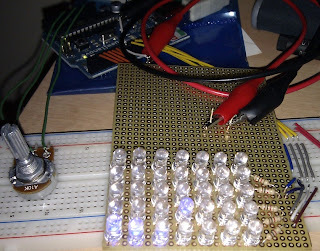 As this matrix will be controlled by an Arduino, the circuit voltage will be 5V. So I soldered 100 Ohm resistors to the columns, so that at any given time the lit LED closing the circuit receives the datasheet recommended 20mA at 5V. 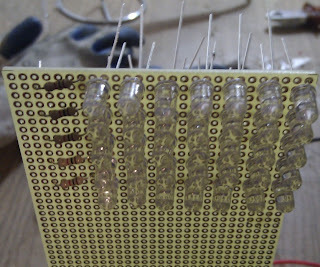 I chose to connect the resistors with the columns because that way I would only need 5 resistors. I could connect them to the rows, as they would have the same effect on the circuit. In order to connect the rows without touching the columns, I use a screwdriver to help me bend the ends. This circuit has 12 ends, and all must connect to the Arduino. The simplest form to connect them is by linking each end to an Arduino pin. 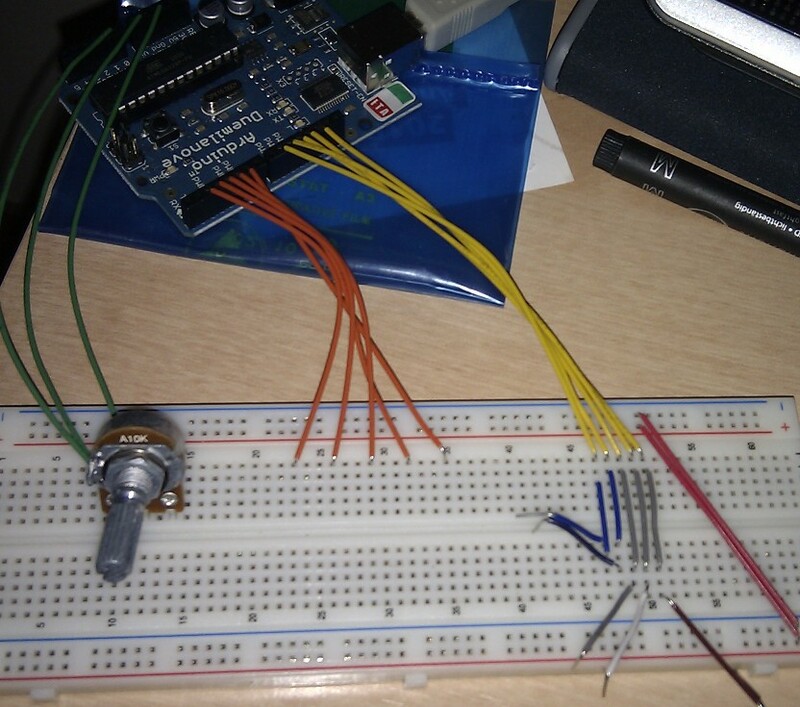 As the resulting circuit is still very frail and hard to manage, and I didn't have enough parts to make a better solution, I connected the Arduino to a breadboard so I could test the circuit. You will notice a potentiometer also connected to the Arduino. I used it to control the refresh rate of the matrix, by defining the value passed to the delay function between each pass. 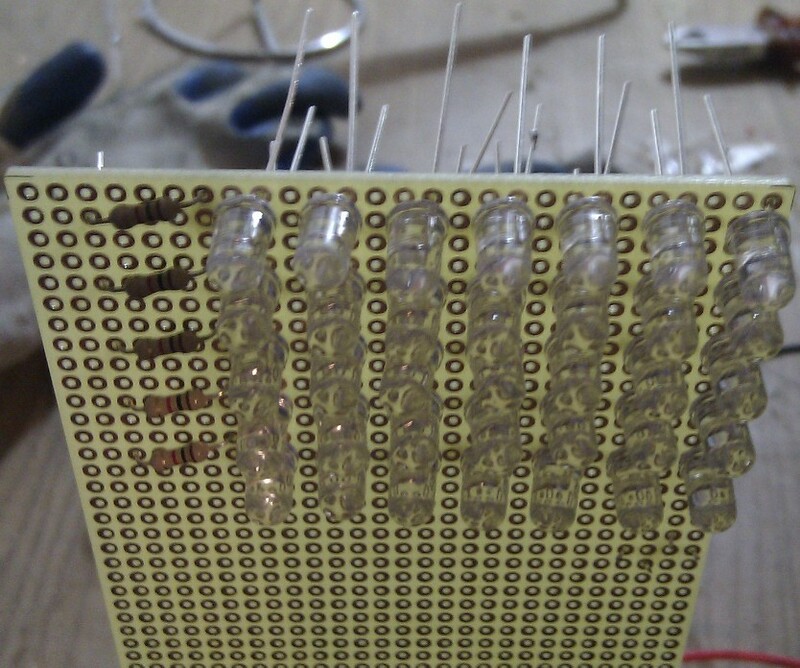 The hardest part was to connect the circuit to the breadboard, because I had very little space to maneuver the LEDs ends below the board. Also I only had some already cut wires (in groups of 5 for each length) for use with a breadboard, that are not fit for this kind of connections. 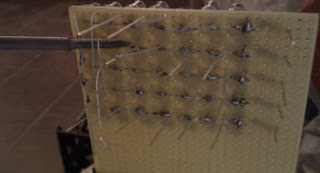 As you can see I had to use two wires with claw ends for the two remaining pins. Connected to those claws are ends I had to cut of broken LEDs, in order to connect to the breadboard below. This is just a basic program to try out the matrix. It lights only 1 LED at any given time and defines a very high refresh rate, so that to our eyes it would seem that all LEDs are on at the same time (persistance of vision - POV). We use digitalWrite() to define if the pin(i) will provide 5V (HIGH) or act as GND - 0V (LOW). To light a LED we need to HIGH the anode controlling pin and to LOW the cathode controlling pin. With analogRead() we can read a number between 0 and 1023 from an analog pin, and with a potentiometer connected to it, we can physically control variables, as the delay between the lighting of a LED. For a friendlier range of values there is the map() function. 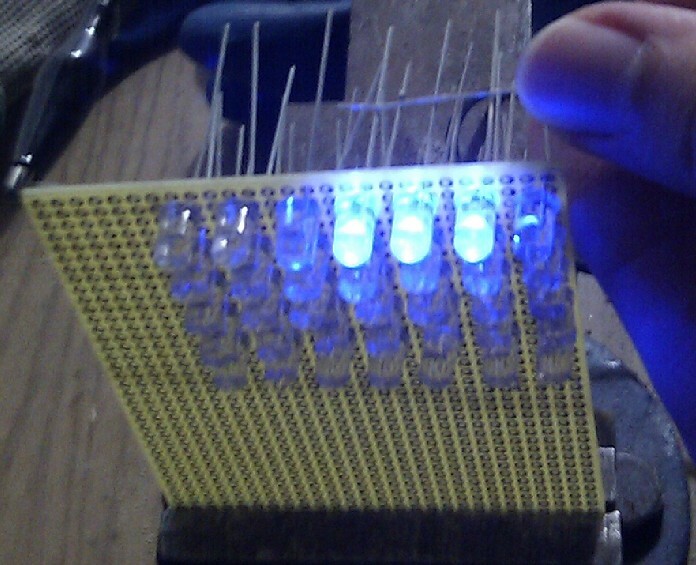 After some research for other Led Matrices on the web I found an interesting tutorial on hackaday. Now I will try to use more Leds on my matrix to make the best use of Arduino. 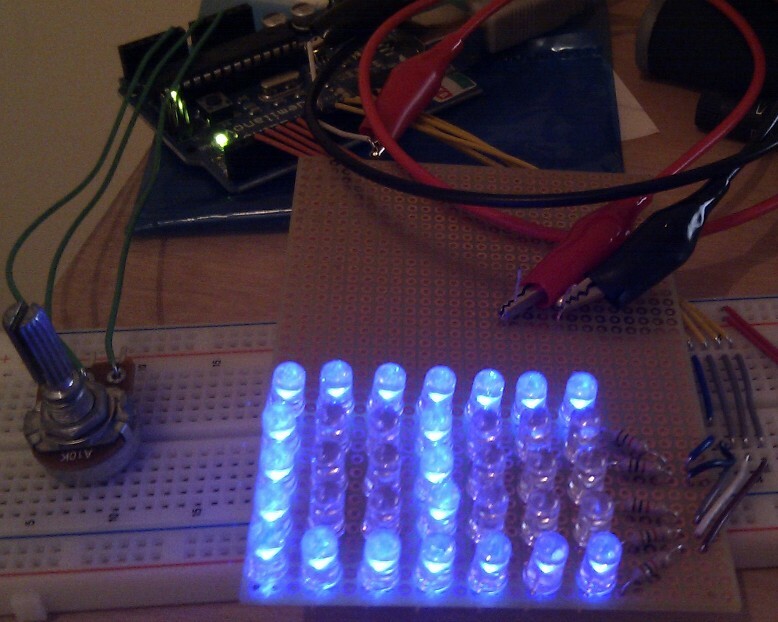 My Led Matrix works because I'm only lighting ONE led a a time. If I tried to light more than two Leds in the same row/column at the same time I would burn my Arduino. As you can see in the datasheet, each pin can only support 40mA. In lighting 1 Led, in this matrix, it creates a current of 20mA (as defined above). With 2 Leds lid, 40mA will run on the circuit. 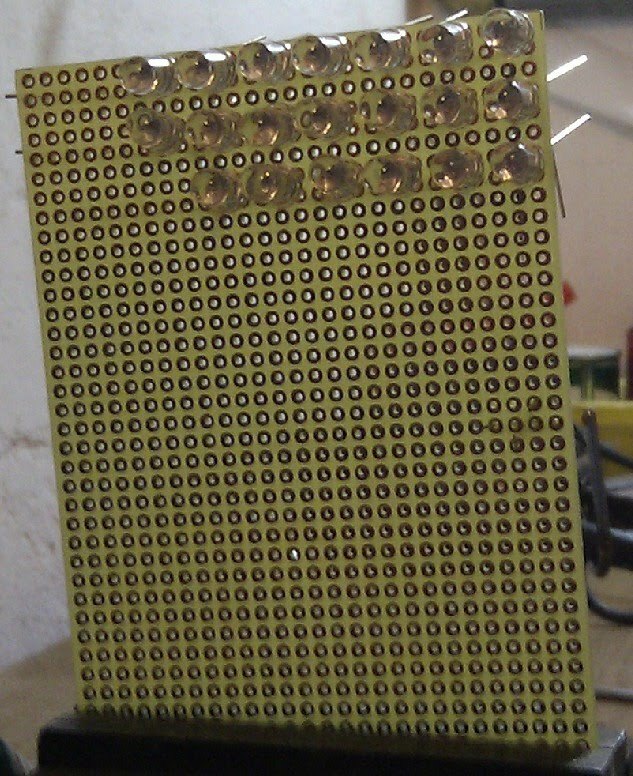 So to correct this issue I should be using transistors, but that I'll talk about in the next post (part 2).